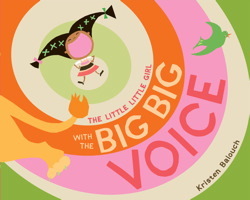 The Little Little Girl With the Big Big Voice by Kristen Balouch. Little Simon, 2011. Currently available. Face Value: The bright colors caught my eye. And, of course, the little girl bellowing with all of her might. I could not resist the infectious energy of the girl’s voice echoing all over the cover and scaring away the creatures. As a complete package, the bold graphic design of this is very appealing. Does it break the slate? Yes, this picture book breaks the slate, even though it is short and sweet and has very few words. The little girl in the story is never told to be quiet or to hide her voice – instead of toning it down so that the more timid creatures will play with her, she persists until she meets a friend who can handle her the way she is. That, my friends, is slatebreaking. It completely shatters the “seen and not heard” expectations that are still imposed upon many little girls. Who would we give it to? I would give it to any little girl who has been shushed too many times by the grown-ups in her life. Review: There is something delightfully subversive about this seemingly demure picture book. During the first read through, it’s very “Awww, shucks.” It is a cute story about a girl who goes looking for a friend and finds one. There is not much about that story line that is new or exciting – we’ve definitely seen that before. But this particular story about finding a friend is different because we see a bombastic and outspoken girl finding her place in the world without compromising her personality. That is unusual, and very, very cool. The little little girl of this story is looking for someone to play with. Unfortunately, she has a big big voice that tends to startle her potential playmates. Finally she meets her match: a lion with a voice as big as hers. At first she doesn’t know how to respond to the lion’s roar – but when she bursts out laughing, they become fast friends and revel in their big voices together. It is not an overtly feminist story, but to me the hint of defiance in the girl’s actions is what makes is slatebreaking. There is something that hints of folk art in the illustrations. The loud colors complement the distinct shapes, and I really like the bright, pop-art feel that accompanies the story. The echoing concentric circles behind the little girl made it feel as if her voice was bouncing off the pages. I could practically hear her shrieking in delight. There is a lot of movement suggested in these striking images. See? Doesn’t that make you want to wiggle around? I also loved the little girl’s beautifully expressive face throughout the story. Balouch created simple but engaging artwork – for me, that’s a winning quality in a picture book. There is also a subtle nod to diversity in this book. The girl is not white, and there’s no explanation or justification of her race. I was thankful for that. It’s nice to have a picture book featuring a little girl of color where the story wasn’t exclusively focused on her cultural experience. Although I would heartily recommend this as a one-on-one read-aloud, I would be wary to make it a bedtime book. It made me want to shout and dance and jump around, and I can’t imagine those impulses would be welcome at bedtime. Save it for an afternoon when you and your young reading companion can make noise together. This entry was posted in Picture Books, Reviews and tagged Little girls, Picture Books, Read-aloud. Bookmark the permalink.